Although I was new to the world of 3D modeling at the time, I was quickly captivated by Fusion's zealous user base. They comprise a mix of (1) enthusiasts and students who want to learn 3D printing, (2) start-ups trying their first CAD/CAM software, and (3) seasoned industry pros looking to replace or enhance their current modeling capabilities. As different as these customers are, they have one thing in common — a contagious passion for making things. Today I continue to independently plan, execute, and deliver user research for Fusion. I work closely with designers, product leads, and data analysts to prioritize which studies need to be done, and how to make research findings actionable at each stage of the product lifecycle. Recent exciting examples of my research's influence include a Monthly Active User study whose corresponding onboarding enhancements resulted in a 9% increase in new user conversion, and a series of usability interviews for our new browser platform that identified critical bugs and design fixes for improved user workflows. Below is a snapshot of the diverse methods and platforms I employ across generative, evaluative, and validative research stages. Note: Case studies available upon request. Field visits with customers such as APROE, Alta Motors, Portland Community College, Northrop Grumman, ProtoPasta, Opendrone, and Grovemade. Participatory design sessions to understand how/why users imagine future product solutions — for example, new collaboration experiences in Fusion. Needs gathering interviews to learn users' behaviors, attitudes, workarounds, and more. Recent topics: Concurrent Engineering, Release Management, Touch Interaction Design, and Virtual Reality. Persona development and journey mapping to focus in on our key customer profiles and their workflows. Task-based usability studies of prototypes and development builds to collect feedback on new designs. Releases include: New User Onboarding, Sheet Metal, Fusion 360's design browser, Data Experiences, Rendering and Simulation Tools. Benchmark studies to understand how well our essential 3D workspaces are performing over time. UX acceptance criteria to meet a baseline target for user success before every feature release. Quarterly surveys to capture customer satisfaction, install/uninstall experiences, user demographics, and more. 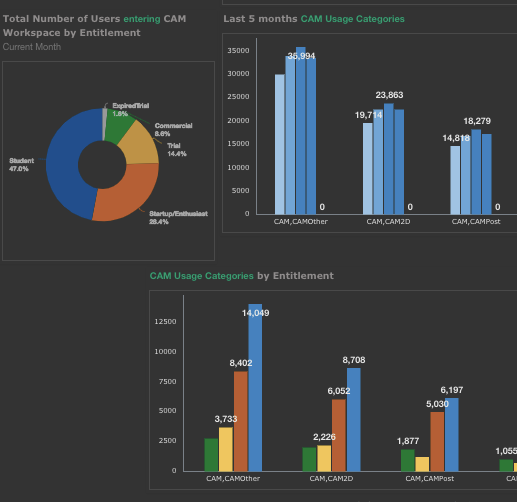 User analytics to measure customer acquisition and product usage workflows. Usage is tracked from beta stage through final production. Platforms: Google Analytics, Mixpanel, and Splunk. Ongoing feedback collected from our active community forums and UserVoice widgets (in-product form for customer comments and NPS). Insights are identified using a combination of Clarabridge analysis and custom text mining models.